Most Loyal Two alumni of the Statler College were honored as “Most Loyals” during WVU’s 71st Mountaineer Week. Wellsburg native and four-time WVU grad William Cawthorne was named Most Loyal Alumni. Cawthorne recently served as mentor for WVU’s entry in EcoCAR3, an advanced vehicle technology competition sponsored by General Motors with the goal of creating a hybrid-electric Chevrolet Camaro that decreases environmental impact but maintains the performance of the iconic car. He guided more than 100 undergraduate and graduate students competing in the four-year competition, culminating in a second-place finish this past year and more than 15 students with jobs in the automotive industry. Cawthorne, who is the senior manager of advanced engineering for global transmission and electrification at General Motors Global Propulsion Systems in Milford, Michigan, has been involved with every electrified product GM has put into production during his tenure. He has been granted more than 65 U.S. patents and is a two-time winner of the Boss Kettering award, GM’s highest honor for recognizing technical innovations. Most Loyal Faculty was awarded to Powsiri “Klink” Klinkhachorn, a professor in the Lane Department. A two-time graduate of WVU, Klinkhachorn has led multiple WVU robotics teams to top finishes in national and international competitions and was an advisor to the winning team in the Sample Return Robot Challenge, part of NASA’s Centennial Challenges. He has received numerous teaching awards including West Virginia Professor of the Year from the Carnegie Foundation and the Council for the Advancement and Support of Education. Klinkhachorn earned the Thailand National Science Fair Award and was a finalist in the INTEL 8086 Application Contest. Teaching Two teachers from the Statler College were among six honored by the WVU Foundation Award for Outstanding Teaching in 2018. A WVU alum, Todd Hamrick joined the faculty in 2011 after a 22year career in the engineering industry. He is a long-time mentor for youth organizations, including Boy Scouts, 4-H, First Robotics and the award-winning Mountaineer Area Robotics. Hamrick is also a faculty member of Community Engagement of Science Through Art, a program that brings artists, scientists and engineers together for the design and construction of science-based educational art exhibits. His teaching style brings practical, innovative, experienced-based learning to the classroom, where hands-on projects reflect real-world applications. Throughout his 28 years at WVU, David Martinelli has promoted collective learning and individual engagement through an emphasis on critical thinking and the incorporation of guest speakers. In the classroom, he demonstrates the importance of contextual awareness through problem-solving in situations like traffic congestion, highway safety, energy dependence and infrastructure investment. He encourages his students to make sure they understand the technical elements of any problem they wish to solve and then to fully embrace the reality that their solutions are not implemented in a vacuum. The honorees received a $5,000 honorarium from the WVU Foundation. The Society of Petroleum Engineering recognized Samuel Ameri, chair and professor of petroleum and natural gas engineering, for outstanding teaching. The Distinguished Achievement Award recognizes superiority in classroom teaching, excellence in research, significant contributions to the petroleum engineering profession and/or special effectiveness in advising and guiding students. One of only 14 worldwide to be selected, Ameri was selected in the Eastern North America Region, which encompasses 25 states and the District of Columbia. Philanthropy Ben and Jo Statler were honored as outstanding philanthropists at a luncheon hosted by the Western Pennsylvania Chapter of the Association of Fundraising Professionals in Pittsburgh for National Philanthropy Day. The Statlers have shown remarkable generosity and leadership, with the direct impact of their lifetime of support to WVU at nearly $60 million, making them WVUâ&#x20AC;&#x2122;s largest benefactors. In recognition of their support, the College of Engineering and Mineral Resources was renamed the Benjamin M. Statler College of Engineering and Mineral Resources in 2012. Over the years, the Statlers have supported many WVU initiatives, including the comprehensive breast cancer program at WVUâ&#x20AC;&#x2122;s Cancer Institute, the new Erickson Alumni Center building, the Basketball Practice Facility and other Athletics capital improvements. 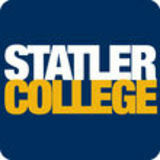 The Statler College mission is to prepare students for success in their professional careers; to contribute to the advancement of society through learning, discovery, extension and service; and to stimulate economic well-being in West Virginia and the world through technical innovation, knowledge creation and educational excellence. Engineering West Virginia is published twice each year, in spring and fall, for the alumni, friends and other supporters of the WVU Benjamin M. Statler College of Engineering and Mineral Resources. Copyright ©2019 by the WVU Benjamin M. Statler College of Engineering and Mineral Resources. Brief excerpts of articles in this publication may be reprinted without a request for permission if Engineering West Virginia is acknowledged in print as the source. Contact the director for permission to reprint entire articles. The WVU Board of Governors is the governing body of WVU. The Higher Education Policy Commission in West Virginia is responsible for developing, establishing and overseeing the implementation of a public policy agenda for the state’s four-year colleges and universities. On the cover: Morgan Szafranski juggles four majors with being a resident advisor, internships and owning his own business. When I was in school, most of us were working hard to complete one or possibly two engineering majors in four to five years. 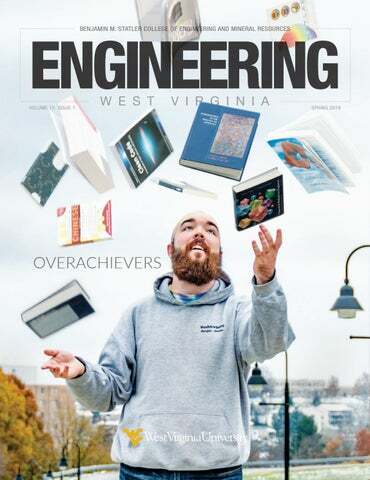 But as you will read in this issue of Engineering West Virginia, we have students who are majoring and minoring in multiple areas. In their “spare” time, some are members of the WVU Honors College and Tau Beta Pi. Others are members of the Pride of West Virginia and student organizations like the Society of Women Engineers and the Institute of Electrical and Electronics Engineers. All are research active. I can only imagine what their weekly day planners must look like! They are stellar examples of the wealth of opportunities available to students in the Statler College. From competitive project teams to volunteer opportunities to internships, every student can explore whatever piques their interest in and out of the classroom. Many of these students graduate and go on to accomplish amazing things. Take Morgan King, who graduated this past May with a degree in civil engineering and minors in international and comparative politics. Currently teaching in Spain on a Fulbright Scholarship, Morgan was named WVU’s third Marshall Scholar. She will enroll in University College London in September where she will earn two master’s degrees. Mark Ziegler, who graduated in December with degrees in mechanical and aerospace engineering, is living life in the fast lane as an aerodynamics design engineer with Roush Fenway Racing. He credits internships with Arena Racing USA, Chip Ganassi Racing and Rooster Hall Racing with helping him land his dream job. Four-time graduate Bill Cawthorne, who was named WVU Most Loyal Alumni this past fall, is the senior manager of advanced engineering for global transmission and electrification at General Motors Global Propulsion Systems. In his “spare” time, he served as the mentor for the WVU entry in the EcoCAR3 competition, a role he will reprise in the upcoming EcoCAR Mobility Challenge. And two-time graduate Powsiri “Klink” Klinkhachorn will again lead a team of Mountaineers into its third-straight NASAsponsored Moon to Mars Ice and Prospecting Challenge. The energy and enthusiasm our students, alumni, faculty and staff bring to this College is contagious. Catch the bug and join me in supporting and cheering on their drive to succeed. West Virginia University continues to rank among the nation’s elite research institutions as reflected in the Carnegie Classification of Institutions of Higher Education. Carnegie released its every-three-year assessment in December, and WVU continues to be rated as an R1, or very high research activity institution, the most elite category for research-focused schools, alongside such institutions as Harvard, Yale, Columbia and Johns Hopkins. Only 130 of the nation’s 4,500 colleges and universities attain this ranking. “As most any coach will tell you, getting to the top is easier than staying there,” President E. Gordon Gee said. “While it was an achievement to reach the R1 level in 2015, it is even more of an accomplishment to repeat the honor in 2018. “We have a stellar team, and this ranking recognizes their continued efforts,” he said. The classification “reflects our continued commitment to engaging in research at the highest level,” said Fred King, WVU’s vice president for research. “Ultimately this recognition is the outcome of doing the right thing – our goal should be to do great work, and classification as an R1 is an outcome of working toward that goal.” To achieve R1 status, a university must award doctoral degrees in at least 20 different areas and amass at least $43.8 million in total research expenditures, as reported through a National Science Foundation survey. The difference between being deemed R1 or R2 – the next highest category – can come down to how much a university spends on research, the size of its dedicated research staff or the number of doctoral students it graduates. Vinod Kulathumani, associate professor of computer science and electrical engineering, is part of a research team that has won the R&D 100 Award. The awards, known as the “Oscars of Innovation,” honor the top 100 proven technological advances of the past year as determined by a panel selected by R&D Magazine. Working in partnership with researchers at Los Alamos National Laboratory, Kulathumani developed an ultra large-scale sensor network for detection of storm water overflow in real-time. To the best of his knowledge, it is the largest flat, multi-hop sensor network in terms of the area covered. “Flat networks have no high-power gateways or cellular links in the middle, which are simply infeasible to deploy in rugged terrains,” Kulathumani said. “The deployed system, which has been operational for about a year, covers about 40 square miles of rugged mountainous terrain with a 300-plus feet vertical change using more than 120 sensors.” While Kulathumani notes that the network is critical due to the chemical nature of storm water runoff, he added that it has applications beyond that, including applications arising from requirements of remote monitoring in large inaccessible areas such as deserts, forests and arctic regions, even for space exploration. “The system configures itself when nodes are added, deleted or moved,” Kulathumani explained. “It is also robust to transmissionrelated losses arising from harsh terrain. Unlike satellite- and cellular-based systems, this solution does not require a third-party infrastructure and data access fees. Instead, the network software and data is owned by the customer.” “Dr. Kulathumani is an outstanding teacher, researcher and mentor. His work in networking techniques to build wireless sensor networks in rugged terrain without external infrastructure is groundbreaking,” said Brian Woerner, chair of the Lane Department of Computer Science and Electrical Engineering. “While there are significant military applications of this technology, the commercial applications of these networks to monitor civilian infrastructure in rural regions such as West Virginia are equally as exciting.” The R&D 100 Awards span industry, academia and governmentsponsored research organizations. The winners were announced at the 2018 R&D 100 Conference, held November 15-16, in Orlando, Florida. This is the fourth R&D 100 Award won by researchers at WVU since 2011. Nianqiang (Nick) Wu, professor of mechanical and aerospace engineering, was named to the Clarivate Analytics Highly Cited Researcher list for 2018. The citation analysis identifies influential researchers as determined by their peers around the globe – those who have consistently won recognition in the form of high citation counts over a decade. The Web of Science serves as the basis for the regular listings of researchers whose citation records position them in the top one percent by citation for their field and year. Wu is the only researcher at West Virginia University to make the 2018 list. Yanfang Ye, assistant professor of computer science and electrical engineering, has been awarded a grant from the National Science Foundation in support of her work to enhance security for modern software programming cyberinfrastructure. The award comes with $649,156 in funding over a three-year period. Software plays a vital role in supporting scientific communities. Modern software programming cyberinfrastructure – or CI – consisting of online discussion platforms like Stack Overflow and social coding repositories such as Github, offers an open-source and collaborative environment for scientific communities to expedite the process of software development. Within this ecosystem, researchers and developers can reuse code snippets and libraries, or adapt existing ready-to-use software to solve their own problems. One such example, CycleGAN, a software developed by computer vision researchers, has been shared by the research community to expedite the development of novel image processing applications. “Despite the apparent benefits of this new social coding paradigm, its potential security-related risks have been largely overlooked; insecure or malicious codes could be easily embedded and distributed, which could severely damage the scientific credibility of CI,” said Ye. “For instance, as cryptocurrency has grown in popularity, attackers have injected malicious mining code into GitHub. It’s predicted that 2018 would be a year of cyberattacks on critical infrastructure with colleges and universities becoming the primary targets of these attacks. There is an urgent need for developing scalable techniques and tools to automatically detect these open-source insecure or malicious codes.” Ye will focus her efforts on the development of new techniques by exploring innovative links between artificial intelligence and cybersecurity to automate the detection of insecure and malicious codes on social coding platforms. Her proposed techniques will benefit scientific communities and society as a whole by promoting the efficiency of cyber-enabled software development without sacrificing the security. Ye has extensive research and development experience in internet security solutions. Before joining WVU, she was the principal scientist in Comodo Security Solutions, Inc., a provider of computer software and SSL digital certificates, and deputy director at Kingsoft Internet Security Corporation, the second-biggest internet security company in China. Ye proposed and developed cloudbased solutions for mining big data in the area of internet security, especially for malware detection and phishing fraud detection. Her developed algorithms and systems have been incorporated into popular commercial products, including Comodo Internet Security and Kingsoft Antivirus that serve millions of users worldwide. She also recently received the prestigious ACM SIGKDD 2017’s Best Paper and Best Student Paper awards (Applied Data Science Track), the IEEE EISIC 2017 Best Paper Award and the 2017 New Researcher of the Year Award from the Statler College. As part of the grant, Ye, in collaboration with Xin Li, professor of computer science and electrical engineering, and Brian Woerner, chair and professor of computer science and electrical engineering, will design and deploy the proposed techniques and developed tools for scientific and engineering communities to enhance code security spanning the entire CI ecosystem. The team will also establish a Cybersecurity Lab at WVU, which will become a playground for cybersecurity training for both students and professionals. Saiph Savage, J. Wayne and Kathy Richards Faculty Fellow and assistant professor in the Lane Department of Computer Science and Electrical Engineering, has been selected by MIT Technology Review in Spanish as a 2018 Innovator Under 35 in Latin America. The award recognizes individuals whose technical work promises to shape the coming decades. Selected by a jury of tech experts, winners are honored for creatively applying technology to solve the world’s biggest problems. One of only nine women recognized, Savage was selected in the Pioneers category for her work using social media bots to mobilize people to collaborate in activities of positive impact. Yanfang Ye, assistant professor of computer science and electrical engineering, and her collaborators have received the prestigious Challenge Problem Winner award in the Artificial Intelligence for Cyber Security Workshop. AICS 2019 emphasizes research and applications of techniques to attack and defend machine learning systems or adversarial learning, especially in the context of cyber security. The Challenge problem, “Malware Classification Under Adversarial Conditions,” challenged competitors to construct artificial intelligence-based malware classifiers based on redacted data that would be robust to adversarial attacks. Ye’s paper, “Enhancing Robustness of Deep Neural Networks against Adversarial Malware Samples: Principles, Framework and AICS 2019 Challenge,” was chosen as the winner among all the submissions. Researchers at WVU have been awarded a grant from the National Science Foundation to study methane emissions from natural gas well sites. The three-year grant comes with more than $320,000 in funding. Large uncertainties exist in the ability to measure and quantify the amount of methane, a potent greenhouse gas that is released along the natural gas supply chain. Recent studies have shown significant variations in methane losses, and if these losses are large enough, they may mitigate the benefits of natural gas use. The research team, led by Derek Johnson, associate professor of mechanical and aerospace engineering, will be investigating the combination of new measurement technologies and techniques to JOHNSON understand and accurately gauge these emissions. Working alongside students and Omar Abdul-Aziz, associate professor of civil and environmental engineering, the team will collect and analyze downwind and ABDUL-AZIZ component-level measurements of methane fluxes along with atmospheric changes in an effort to create a data model that would replace the labor-intensive leak detection schemes currently being used. The model could benefit researchers, regulators and the industry. “Our team at WVU previously developed a system to directly quantify methane emissions from natural gas components, and even though the system is robust and accurate it does require site access and extended personnel efforts on site,” Johnson said. “Both industry and researchers are developing technologies that can be deployed near the site that require less physical labor. Our team will develop an overall approach of combining the best data from multiple techniques to develop a more efficient method of methane quantification. “These new approaches will reduce uncertainties between studies, which will help improve the greater understanding of methane emissions,” Johnson said. “These tools will also help industry to identify excessive emissions so that they can be remedied immediately in efforts to conserve natural gas and reduce their greenhouse gas footprint.” Johnson and Abdul-Aziz will leverage industrial collaborations at the Marcellus Shale Energy and Environmental Laboratory in Morgantown, along with the WVU Energy Institute, to conduct seminars and disseminate the results of their research. The largest estuary in the U.S., the Chesapeake Bay is home to more than 300 species of fish and numerous shellfish and crab species. It’s also home to Vibrio bacteria, a food-borne infection associated with eating undercooked seafood. of pathogens in Bay-associated water, plankton and oysters, considering the environmental and geophysical processes that modulate these relations.” Prior studies clearly indicate that the frequency of Vibrio occurrences are influenced by environmental factors, and under certain conditions, these bacteria enter into a viable but nonculturable state. Detecting the presence of pathogenic Vibrios is critical because loss of culturability does not guarantee loss of virulence. “This research will enhance our understanding of the occurrence and abundance of clinically important Vibrios in the Bay using satellite remote sensing-inspired simulation and a prediction risk model integrating the ecological theory of pathogens through exhaustive sampling in the region,” Jutla said. R&D IN BRIEF MINE SAFETY AND HEALTH RESEARCH The Alpha Foundation for the Improvement of Mine Safety and Health awarded additional funds to V’yacheslav Akkerman, associate professor of mechanical and aerospace engineering, to expand his research on the predictability and hazards related to mine fires. The first award, in 2014, led to the development of the Dust and Gas Explosion Model, or D-GEM, a joint analytical and computational platform quantifying mining fire hazards, namely, the probability of spontaneous ignition, the evolution of a flame front and the likelihood of a deflagration-to-detonation transition in the presence of combustible dust. Jutla has done extensive research in hydroepidemiology, which he describes as the nexus of hydroclimate, the environment and human health. He leads the Human Health and Hydro-environmental Sustainability Simulation Lab at WVU, an interdisciplinary research group that investigates how extreme events and enhanced climatic variability impact the emergence of waterborne pathogens that cause infection in humans. Through the use of satellite data, Jutla and his research team are able to create models that predict the distribution of pathogens across the globe. Recent models he created to predict cholera outbreaks in Yemen were found to be highly effective in controlling outbreaks in 2018.
unknown parameters and then further test an upgraded D-GEM. Joshua Brady, associate director of mining extension, and Eduardo Sosa, research associate professor in mechanical and aerospace engineering, were awarded more than $52,000 for one year from the U.S. Department of Labor, Mine Safety and Health Administration to provide miners with hands-on, realistic training on how to handle an explosion or fire in a mine. Utilizing WVU’s Academy for Mine Training and Energy Technologies, training will focus on Self-Contained Self-Rescuer expectations training and mine rescue training. According to Brady, more than 600 individuals will benefit from the training, which should significantly contribute to increasing a miner’s emergency response skills for effectively responding to incidents involving fires in coal mines. STUDYING GREENHOUSE GAS FLUXES IN COASTAL WETLANDS A pair of researchers from WVU have developed a new model to reliably predict the greenhouse gas fluxes of carbon dioxide and methane in coastal wetlands under rising temperatures and changing environments. Omar Abdul-Aziz, associate professor of civil and environmental engineering, and Khandker S. Ishtiaq, a postdoctoral fellow, have developed the model, which was published in a recent edition of the American Geophysical Union’s “Journal of Geophysical Research: Biogeoscience.” Coastal wetlands play an important role in mitigating the effects of GHGs by efficiently removing atmospheric carbon. However, climate change mitigation benefits have to be achieved through conservation and restoration of coastal wetlands. four degrees in just over four years, especially when three of those degrees are in engineering disciplines. There aren’t many students like Morgan Szafranski. In December 2019, just four and a half years after he arrived on WVU’s Morgantown campus, Szafranski, who is in WVU’s Honors College, will earn bachelor of science degrees in computer engineering, computer science and electrical engineering. He will also earn a bachelor of arts degree in Chinese studies. In his “spare” time, he is also a resident advisor in Braxton Tower, which is home to the Engineering Living-Learning Community, and is a member of WVU’s student chapter of the Institute of Electrical and Electronics Engineers, the Chinese Club, CyberWVU and the WVU Collegiate Gaming Club. And, as a sixth grader in 2009, he created a business, Washnwhere (“windows are not a pane to us”), which he continues to run while at WVU, managing contracts and invoicing. professors, which assured her she could succeed in engineering. She settled on mechanical engineering and dropped her music minor. “Before long, I realized that mechanical engineering was alright, but aerospace seemed more interesting and fun,” Cathreno said. “I added an aerospace engineering major sophomore year and quickly found my passion. Somewhere along the way, I ended up adding my math and physics minors. I realized that I had completed all of the required curriculum in these subjects for engineering, but I still wanted more. I added the minors so I could continue and enhance my education in subjects I always found interesting.” Her passion for aerospace engineering led Cathreno, also a member of the Honors College, to a summer internship with NASA, which helped to solidify her desire to one day work in the space industry. She is also a member of WVU’s RockSat-C 16 team, a collaborative effort with academic institutions across the state for the development and design of space payloads. The group hopes to launch its payload next June. After graduating from high school, Morgantown native Matt Keaton came to WVU ready to study his two main passions: mathematics and physics. After opting for a dual degree in mechanical and aerospace engineering, he realized after taking several courses, the degree wasn’t for him. “The second semester of college, I took a mechatronics course, which is a cross between mechanics and electronics concepts,” said Keaton. “Our final project involved creating a robot that would place balls into a basket and navigate an arena using sensors. The work entailed constructing the robot, programming the microcontroller and debugging the program so the robot did the tasks correctly. I quickly noticed that I enjoyed myself far more doing this type of work than what I did in my other classes. I realized I had a true passion for the engineering, mathematics and programming knowledge required for a discipline in this field, so I decided I would be happier in the Lane Department, and the rest is history.” With majors in computer science and computer engineering and minors in mathematics and physics, Keaton, a senior and member of the Honors College, conducts research at WVU’s Rockefeller Neuroscience Institute in connectomics, working to create a 3D map of the brain, including neurons and each of their connections. “Engineering provided the perfect mix of theoretical science and practical application.” —Montana Mascio Mascio, a senior and member of the Honors College, has taken advantage of virtually every opportunity presented to her. She has conducted two technical internships at Covestro, one in industrial coatings and one in polycarbonates, which exposed her to a side of chemical engineering outside of the academic world while providing hands-on experience in areas ranging from cosmetics formulation to injection molding to 3D printing. She credits her minors with helping her build and pitch a business case for increasing sustainable food practices to company leadership. “Due to the writing-heavy nature of many of my strategic social media classes, they were well suited to online completion.” —Montana Mascio allocating time correctly. Working ahead, when a particular day or week allows for it, helps to build in a time cushion for when things may not go quite as planned or take longer than expected. “Completing three minors definitely added to my total course load, so online and summer options have been crucial,” she continued. “In fact, I completed my business administration minor entirely during summer sessions. Also, due to the writing-heavy nature of many of my strategic social media classes, they were well suited to online completion. This helped to keep my schedule manageable each semester.” A “huge animal lover” who describes her dream position as one that allows her to work on a biomedical process for veterinary applications, Mascio will be working as a commercial associate engineer at Braskem in Pittsburgh, Pennsylvania. Claudia Flores-Saviaga, a doctoral candidate at WVU, has won a 2019 Facebook Emerging Scholar Fellowship. This highly competitive fellowship is given to outstanding PhD students from across the world who are engaged in innovative computer science research. The award is designed to support the best and brightest students in the technology sector to conduct research that will impact both academia and industry. Flores-Saviaga will work with Facebook Research for two years to help them improve their technological interventions to limit the spread of false information on the platform. “My previous research has focused on uncovering how bad actors produce collective action on online platforms,” Flores-Saviaga said. “This time I will focus on understanding how citizens coordinate, perceive and influence one another to share, debunk and stop the spreading of fake news across multiple social media platforms.” Flores-Saviaga will focus on investigating how citizens produce collective action to stop misinformation campaigns in different contexts and across popular social media sites. She is also interested in investigating what the most effective techniques or strategies are for stopping influence or manipulative campaigns, giving Facebook a more holistic understanding to fight actors producing fake news and propaganda messages. Working alongside Saiph Savage, J. Wayne and Kathy Richards Faculty Fellow and assistant professor in the Lane Department of Computer Science and Electrical Engineering in WVU’s Human Computer Interaction Laboratory, Flores-Saviaga started her exploration of online spaces by analyzing how political trolls were organizing during the 2016 U.S. presidential elections. She uncovered different collective action strategies that political trolls adopted to mobilize people for the presidential campaign. She also developed novel probabilistic graphical models to uncover how the most active political trolls drove people to action. Her research gained interest from The Associated Press, Newsweek and Salon, among others. “I then began to analyze how the Latino community was targeted on social media during the past midterm election as part of a collaboration with the Institute for the Future,” Flores-Saviaga said. “This research caught the attention of and has received funding support from different think tanks in the U.S. such as the Atlantic Council and the National Democratic Institute.” Through this collaboration with Facebook Flores-Saviaga hopes to share her work and network with the broader Facebook Research community and work on the technology challenges the platform is addressing. “The fellowship is wonderful recognition for Claudia’s experiences working with presidencies in Latin America and in collaborating with centers that conduct policy studies and strategic analyses of political, economic and security issues throughout the world,” said Savage. “This will help Facebook in its mission to create better online experiences for people and help foster the democratic societies we all desire.” More than 900 students from the world’s top universities applied for the fellowship with proposals that addressed specific social computing challenges. Winners receive two years of tuition and fees, a stipend of $37,000 each year, and up to $5,000 in conference travel support. UP TO THE CHALLENGE For the third straight year, a team from WVU will compete in the Moon to Mars Ice and Prospecting Challenge, a special edition competition under NASA’s Revolutionary Aerospace Systems Concepts – Academic Linkage brand of competitions. Ten university teams were selected for the competition, which challenges finalists to design and build hardware that can identify, map and drill through a variety of subsurface layers, then extract water from an ice block in a simulated off-world test bed. The challenge seeks to advance critical capabilities needed on the surface of the Moon and Mars. Looking to build upon its success in the first two challenges, WVU’s Mountaineer Ice Drilling Automated System – or MIDAS III – hopes to again find itself in the winner’s circle. MIDAS I finished first in 2017 and MIDAS II finished second in 2018. Joining WVU in the competition are teams from Carnegie Mellon, Colorado School of Mines, MIT, Northeastern University, Stevens Institute of Technology, University of Houston, University of Tennessee Knoxville and Virginia Tech. Northeastern is the defending champion. APPOINTED Debangsu Bhattacharyya, a professor in the Department of Chemical and Biomedical Engineering, has been named the GE Plastics Material Engineering Professor. Bhattacharyya has conducted extensive research in the areas of advanced modeling and simulation of energy-generating systems, smart-grid, condition monitoring, fault diagnosis, uncertainty quantification, sensor placement, biomimetic control and advanced manufacturing. In 2015, Bhattacharyya won an R&D 100 Award, known as the “Oscars of Innovation,” for the development of a virtual realitybased software that provides the energy industry with an unprecedented high-tech look inside the operation of power plants. In 2016, he won a second R&D 100 Award for creating a toolset that aids in the development of carbon capture. Their innovative method was designed to extract natural gas without producing harmful by-products and allow for local production that would eliminate the difficult task of transporting natural gas in developing countries. Additionally, the by-products created during production could be utilized as fertilizer, making their company both environmentally friendly and sustainable. The event was held in Sao Paolo, Brazil, in August, in conjunction with the third annual Student Congress, an international seminar hosted by the Institute of Electrical and Electronics Engineers and Power and Energy Society. Hasan Ul Banna, an electrical engineering doctoral student from Lahore, Pakistan, won first place along with teammates from Jordan, India and Costa Rica, at the 2018 Green Entrepreneur Competition for their proposal to create a startup company that would use wheat straw, mushrooms and beans to produce natural gas. When the cars from Roush Fenway Racing hit the tracks in the NASCAR Monster Energy Cup Series this year, they will have at least one Mountaineer to thank for their success. Mark Ziegler, who graduated with a degree in mechanical and aerospace engineering in December, officially joined the team at Roush Fenway Racing in January, working as an aerodynamics design engineer. Ziegler conducts design work focused on a car’s aerodynamics and will spend some time at the wind tunnel, trying to find ways to better use some of the areas of the car that are more aerodynamically sensitive. A seasoned team member of WVU’s Formula SAE team, Ziegler completed internships at Arena Racing USA in 2014 and Chip Ganassi Racing in 2017. He spent most of 2018 as a racing intern with Rooster Hall Racing, participating in six touring car races in the 2018 Pirelli World Challenge Series. Thanks to a gift from WVU alums Dan and Betsy Brown, RHR, which is owned by their son, Todd, and his wife, Michelle, were able to offer two internships to WVU students while also supporting the SAE team. Thorsten Wuest, J. Wayne and Kathy Richards Faculty Fellow and assistant professor in the Department of Industrial and Management Systems Engineering, served as a member of the editorial board for the 2018 World Manufacturing Forum Report. The white paper, which was released in September, outlined the current state of manufacturing in numbers, societal megatrends and manufacturing challenges to discover what actions are needed in the journey of achieving the future-oriented development. Wuest, who was responsible for identifying, recruiting and interviewing experts to gather the insights that shaped the report, said there were certain aspects of the report that piqued his interest. One dealt with changing perceptions toward overextraction and scarcity of natural resources. The report noted renewable energy, better industrial practices and technological developments in resources extraction as being key to becoming more efficient and yielding more product and less waste, as well as increasing the overall amount of economically and technically accessible resources. Other key recommendations in the report are the need to strengthen and expand infrastructure to enable future-oriented manufacturing, design and production of socially oriented products, exploration of the real value of data-driven cognitive manufacturing and development of effective policies to support global business initiatives. For the second straight year, the team from WVU took home top honors in the Society for Mining, Metallurgy and Exploration–Eastern Collegiate Mine Rescue Fall 2018 Competition. Building on the success of its Fundamentals of Engineering program for freshmen, the Statler College has opened an Advising Center for sophomores, juniors and seniors. The Center, which is located in Room 151 of the Engineering Sciences Building, is managed by Michelle Poland, interim director. She is joined on a part-time basis by Chris Randall, program coordinator in the Lane Department of Computer Science and Electrical Engineering. Both Poland and Randall have been recognized by the College and University for outstanding advising. The Center will be an integral part of the College’s Office of Student Services, led by Sarah Lowery. As part of a phased rollout, the departments of civil and environmental engineering and computer science and electrical engineering transferred advising responsibilities to the Center in fall 2018. The remaining departments are expected to be on-boarded by the 2019-2020 academic year. While many students traveled far and wide to participate in internships over the summer, three students in the Statler College found the best opportunities right on campus. Edward C. Prado, U.S. Ambassador to Argentina; Rossana C. Jaca, professor, UNCo; Eduardo M. Sosa, WVU; Christopher Stevens, country manager, Chevron. from the program. Sosa anticipates the first group of students traveling to UNCo either during spring break or the first summer session of 2019. UNCo students are expected to arrive at WVU next summer. “Public-private partnerships address society’s most pressing concerns by fostering innovation that builds the 21st century’s workforce critical thinking skills to solve realworld problems,” said Edward C. Prado, U.S. Ambassador to Argentina. “The 100,000 Strong in the Americas Innovation Fund provides Argentina and the United States with dynamic partnerships that fuel economic prosperity for the region.” Argentina ranks fourth in this signature hemispheric-wide education initiative with 17 Innovation Fund partnerships between 36 institutions in 14 U.S. states and seven Argentinian provinces. Engineering 360˚ When Connor Haynes decided to pursue a degree in computer science, he never dreamed that he would one day be developing video games, let alone running his own company. Now a senior, Haynes celebrated the release of Perspectrum, a two-dimensional side-scrolling puzzle-platform game produced by his company, Proud Mom Games. David G. Zatezalo, assistant secretary of Mine Safety and Health, presented the Department of Mining Engineering’s annual William N. Poundstone Lecture in September. O. “Bob” Orders, a 1972 civil engineering ORDERS graduate,Robert was named chair of the WVU Foundation board TO LEAD of directors in August. A member of the board since Orders is CEO of Orders Construction Company, FOUNDATION 2011,Inc., a highway, utility and industrial construction BOARD company with operations in West Virginia and Virginia. President Donald J. Trump nominated Zatezalo to be the ninth assistant secretary for Mine Safety and Health; he was sworn in November 2017. Finding balance between working on the video game and his engineering studies was not always easy. Being a self-taught programmer certainly came with added challenges but also some unexpected benefits. A native of West Virginia and a 1977 graduate of mining engineering, Zatezalo has spent a lifetime working in mining. He began his career as a union miner and since then has held positions at a number of companies as shift foreman, engineering superintendent, mine manager, vice president of operations and chief executive officer. Zatezalo has worked in mining all across the U.S. and internationally in Australia. BLAZING NEW TRAILS Seeking to build off its second-place finish in the final year of the EcoCAR 3 competition, the team from WVU was one of 12 to be selected for the EcoCAR Mobility Challenge, which will feature the 2019 Chevrolet Blazer as the vehicle platform. Hundreds of engineering students from West Virginia University walked across the stage in the WVU Coliseum this past May to receive their diplomas. Included in that group were the first graduates of the Statler College’s online graduate program in safety management. Two of the graduates – David McMillan and Alex Stokes – chose the program because of its flexibility and the opportunities they felt it could offer them upon completion. The EcoCAR Mobility Challenge is a four-year Advanced Vehicle Technology Competition sponsored by the U.S. Department of Energy, General Motors and MathWorks, and managed by Argonne National Laboratory. Students are challenged to increase vehicle efficiency by developing connected and automated vehicle – or CAV – technologies and implementing advanced propulsion systems and electrification. The goal is to reduce energy consumption while maintaining the performance, safety and overall sporty design and feel of the original vehicle, specifically for a carsharing market. McMillan, a native of Dawson, is a major with the West Virginia Army National Guard and a sergeant with the West Virginia State Police. Calling himself “honored to be a graduate of West Virginia University,” he said the program fit his “time-constrained schedule” and allowed him to work two jobs and maintain a family, all while networking with other students in the program. A resident of Auburn, Alabama, Stokes discovered the program through the Board of Certified Safety Professionals online education search tool. An environmental health and safety engineer, he decided to enroll at WVU knowing that the degree could lead him to a Graduate Safety Practitioner designation. Divided into four academic years, each year introduces new challenges and objectives, following the vehicle development process to design, integrate and refine vehicles into reliable, energy-efficient mobility systems. In addition to the Chevrolet Blazer, GM will supply each team with $20,000 in seed money, along with options for powertrain components and batteries and extensive technical support and mentoring. For the second straight year, Perry L. Ballard, president/owner of Ballard Safety LLC in Martinsburg, was named the World Safety Organization 2018 Safety Person of the Year. Ballard, a longtime member of WSO’s board of directors, has been a WSO member since 2000. He is the founder of Ballard Safety LLC and has more BALLARD than 24 years of experience working with government agencies, commercial/construction industries and manufacturing companies to reduce potential occupational injuries, federal citations, workers compensation claims and general liability concerns by completing appropriate safety BALLARD and environmental inspections with detailed resolutions. Ballard earned his master’s degree in safety management from WVU in 1995. AT LEAST ONE MEMBER OF THE WVU CLASS OF 2019 ALREADY KNOWS WHERE SHE WILL BE HEADED POST-GRADUATION. Peyton Panger, a mechanical and aerospace dual major and WVU Honors College student from Charleston, has been selected for GE’s Edison Engineering Development Program. The program provides entry-level engineering graduates with rotational assignments conducting engineering projects driven by real GE business priorities. Each GE business runs its own program, and candidates are required to apply for and rotate within the program at a specific business. Emil Czul, a late West Virginia University alumnus raised in Lochgelly and a 1950 graduate of Oak Hill High School, is making certain that future generations from Fayette County will not struggle to afford college as he did. Czul died in November 2017 at the age of 85 in Kissimmee, Florida. In his will, he left $4 million to WVU to create two endowed full-ride scholarships that will be awarded each calendar year to financially needy students from Oak Hill High School and his home county. Czul worked as a bricklayer for three years and enlisted in the U.S. Army for two years before enrolling at WVU, where he earned his degree in mechanical engineering in 1960. He enjoyed a successful career with the U.S. government in Virginia before retiring in 1988. “My uncle was a handsome, witty and intelligent man. He was a lifelong bachelor. He was an avid reader and a self-taught investor,” said nephew Joe Czul. “He loved West Virginia and its fresh mountain air, Oak Hill High School and cared for WVU.” WVU President E. Gordon Gee said, “This gift from Emil Czul is a prime example of the University’s alumni and the affection they have for this institution. He understood firsthand the struggles many students have and the barriers they face. However, he also knew the opportunities a college education provides. His concern for the people who come after him, and the desire to provide them an easier path than he had, is the embodiment of the Mountaineer spirit.” The idea to create the scholarship for engineering students came about almost 20 years ago. “We believe he credited the success of his career to his engineering degree. He envisioned his gift helping academically able, but financially unable students to attend WVU,” Joe Czul added. “We will be forever indebted to Mr. Czul for his extreme generosity, and I only wish I had the opportunity to know him,” said Gene Cilento, Glen H. Hiner Dean of the Statler College. “His story is one that continues to play out today with deserving students finding it difficult to attend college. His support will allow us to provide scholarships to well-deserving West Virginia students studying engineering. Engineering is a worthy degree, and it is a critically important profession to the success and wellbeing of the United States in an increasingly competitive global environment. We are honored that Mr. Czul invested in the Statler College.” Joe Czul noted his uncle did not come from a wealthy family and attending college was difficult for him. “The need for a good education was ingrained in him as a youngster, and it was no doubt frustrating to not be in a financial position to follow through.” While Czul ended up finding a way to afford college, he wanted to make it easier for future students with the same problem. “Engineering is a difficult major, but it was my uncle’s belief that it is a worthy degree and would allow a needy student to escape poverty and lead a much better life — just as he experienced. There is little doubt this will make a big difference in the lives of perhaps scores of needy students for many years to come,” Joe Czul said. Because of the generous sum of money left by Czul, two graduating seniors per calendar year will have access to an all-inclusive engineering scholarship to WVU. Czul’s intent was for tuition, room, board and books be provided to engineering students demonstrating need and academic promise. The estate gift was made through the WVU Foundation, the nonprofit corporation that solicits and administers private donations on behalf of the University. Members of Leah Berhanuâ&#x20AC;&#x2122;s family were looking for a way to honor her legacy of lending a helping hand to those who needed it. They chose to create the Leah Berhanu Financial Rescue Scholarship at West Virginia University. “She appreciated people who tried to pave the way and be good role models and she wanted to be that for others, too,” said her parents Samuel Berhanu and Seble Hailu. “Whether it was sharing her short life experiences with close friends or giving someone time and a friendly ear, Leah made it a point that she did something worthwhile for someone in need every day.” The victim of a tragic pedestrian-vehicle accident, Leah succumbed to her injuries and passed away on February 1, 2018. The endowment will provide scholarships for undergraduate students in the Statler College’s Department of Civil and Environmental Engineering who demonstrate severe financial need that would likely cause them to discontinue their education at WVU. First preference will be given to female students. “Leah was strong, independent, focused and was destined for greatness,” her family said. “She always liked challenges and she came from a long line of strong women, starting with her great grandmothers. Engineering was not the easiest major to pick especially since Leah knew that women are severely underrepresented in the field, both in academia and as working professionals. Currently, only 14 percent of engineers are women, according to the Congressional Joint Economic Committee and we would like to put some effort into changing that.” The $25,000 endowment includes a gift of $5,000 from The Thrasher Group, a multidisciplinary engineering-architecture firm headquartered in Bridgeport. “The Thrasher Group gave Leah the opportunity to work as an intern, and Leah was looking forward to a full-time appointment with the firm as she was finishing up her course work before she was taken from us,” her family continued. “The firm’s founder, Woody Thrasher, graduated from the Statler College. Mr. Thrasher noticed Leah’s strong interest in engineering, her drive and the way she presented herself in front of a large crowd and offered her the opportunity to work as an intern. After her summer internship, the firm offered Leah a position to work for the company as an engineer after graduation. Leah loved Thrasher and the folks at Thrasher loved Leah.” “By all accounts, Leah had a very bright future ahead of her as an engineer and she left us far too soon,” said Gene Cilento, Glen H. Hiner Dean of the Statler College. “She had a wonderful personality and a very congenial attitude toward everyone. She was actively engaged in professional societies and in wanting to make a difference. We are very grateful to her family for honoring future engineers with this special gift, which will ensure that Leah’s spirit lives on for years to come.” A native of Morgantown, Leah was involved in Adventure WV, serving as an orientation leader and a high ropes course facilitator. She was inducted into Alpha Mu chapter of the Phi Sigma Pi National Honor Fraternity, where she served as the historian and service chair, and was an active member of WVU’s chapter of the National Society of Black Engineers. “Leah loved the outdoors and cherished being a Mountaineer and a West Virginian,” her family said. “WVU and its community meant a great deal to Leah and she meant a lot to the community, as was demonstrated at many events following her passing. We are left with a big hole that we don’t have a planned action or even the foresight to fill. Establishing the endowment provides some chance toward achieving that.” Individuals interested in contributing to the endowment can contact Heather Cross, assistant director of development in the Statler College, at 304-293-4156 or via email at HECross@mail.wvu.edu. The grant was made in conjunction with the WVU Foundation, the nonprofit corporation that generates and provides support for West Virginia University. Isaac P. Long, 82, of Vero Beach, Florida, died on October 13. A native of Charleston, Long earned a degree in electrical engineering from WVU in 1959. He started his career with the DuPont Company in Old Hickory, Tennessee, and ended it in Wilmington, Delaware. After leaving Dupont, Long continued his interest in real estate development and property management. He is survived by his cousins. Kyle Nelson Rogers, 32, passed away in Alexandria, Virginia, on February 21, 2018. He earned his bachelor’s degree in civil engineering from WVU and a master’s degree in project management from George Washington University. Rogers played lacrosse for WVU, and continued his love of the game as a high school coach. He worked as an engineer for the Department of Defense, Navy. He is survived by his wife, his parents and his brother and sister. E. Neil Rush, 86, from Wernersville, Pennsylvania, died on August 14. After serving in the U.S. Navy during the Korean War, Rush enrolled at WVU, where he studied civil engineering. Rush retired from the Voplex Corporation of Rochester, New York, where he was director of manufacturing. He previously served as a plant engineer for Sterling Industries in Morgantown and as vice president and general manager of Canford Manufacturing Corporation of Canton, Pennsylvania. He is survived by three sons. Shawn M. Shisler, 52, of Morgantown, passed away Monday, October 8. A native of Clarksburg, Shisler was a program assistant in WVU’s Department of Mining and Industrial Extension. She is survived by her husband, Eric, and three children. Austin Cole Stratton, 19, of Sod, died on December 1. A sophomore at WVU, Stratton served as a combat engineer with the WV Army National Guard, 119th Sapper Company. He is survived by his mother and stepfather, Renee and Scott Nelson, his father and stepmother, Eric and Kwan Stratton, and his sisters, Haley Stratton and Sam Nelson. David Allen Turner, 63, passed away September 30. Born in Frankfort, Germany, Turner graduated from WVU in 1977 with a degree in mining engineering. He is survived by his wife, Vivian; sons J.D., Chris and Jason; and daughter, Jenna. William Merle Watkins, 92, passed away on December 14. A native of Grafton, he earned his master’s degree in chemical engineering from WVU in 1951 and later earned an MBA in 1974. Watkins spent 33 years as a chemical engineer for Union Carbide Corporation, specializing in international licensing. After his retirement, he served as manager of process engineering at MTI, an engineering contractor. He was a member of the Licensing Executives Society, American Institute of Chemical Engineering and was a Registered Professional Engineer. He is survived by his three children, six grandchildren and four great-grandchildren. Caroline Baker Watts, 91, of Morgantown, passed away on December 7, in Dallas, Texas. A native of St. George, Watts earned bachelor’s and master’s degrees in home economics and child development from WVU in 1954 and 1957, respectively. She began her career as an educator in 1958 and went on to spend 22 years teaching biology at Morgantown High School. After retiring in 1989, she assisted her husband, Royce J. Watts, in arranging conferences in connection with his work at the Statler College and the West Virginia Coal Mining Institute. Together, the Watts were longtime supporters of WVU and the former COMER Museum in the Statler College, which was renamed the Royce J. and Caroline B. Watts Museum in their honor in 2005. Watts is survived by her husband of 68 years and her son and daughter-in-law, R.J. Watts, II and Maureen Watts. and water sanitation processes for communities abroad including Palau, Cypress, Sri Lanka and Russia. He is survived by his wife, Bernice, and four children. On a day that saw 355 pumpkins take the 11-story dive from atop West Virginia Universityâ&#x20AC;&#x2122;s Engineering Sciences Building, it was team 314 from South Middle School in Morgantown that took top honors in the 31st Annual Pumpkin Drop. Their pumpkin landed just one foot from the target, earning them the $100 first prize. Teams from West Virginia, Pennsylvania and Texas competed in the event, which aims to teach engineering concepts by designing an enclosure to protect the pumpkin from damage when dropped from the roof of the building. The Pumpkin Drop was sponsored by the American Society of Mechanical Engineers chapter at WVU. Proceeds benefit the Ronald McDonald House in Morgantown.